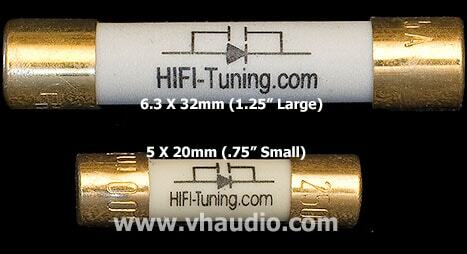 Click here to order HiFi Tuning Fuses online! HiFi Tuning Fuses are getting a good deal of attention recently for the significant improvement yielded in many components, for a relatively modest investment. Most components' fuses could be a potential bottleneck, when you consider the cheapo construction of many standard fuses. The ceramic casing is also considered by some to be superior to glass, due to a more pleasing resonant signature. 500V Large - 6 X 32mm (1.25") Pure silver wire. Brass end-caps, with intermediate pure Silver plating, followed by Copper plating layer, and finished with pure Gold plating, and cryogenically treated. For best performance, the HiFi Tuning fuses should be installed one way, listened to, and then reversed the other way to determine the best sonic orientation. Please check your cart very carfully before checking out, to ensure you are ordering the correct fuses. We cannot accept returns on fuses.